Rencana ini memerlukan kemaskini dalam Bahasa Melayu piawai Dewan Bahasa dan Pustaka. Sila membantu, bahan-bahan boleh didapati di RealD Cinema (Inggeris). RealD Cinema ialah sebuah teknologi penayangan stereoskopik yang dibangunkan dan dijual oleh RealD Inc. Ia adalah teknologi yang paling banyak digunakan untuk menayangkan filem 3-D dalam pawagam. Apabila melihat ke dalam cermin dengan satu mata, the lens over the open eye will always appear darkly tinted in the reflection. Note that there’s a mirror between background and foreground. Teknologi pawagam RealD 3D menggunakan cahaya terkutub bulat untuk menghasilkan imej stereoskopik projection. Teknologi Circular polarization has the advantage over pengutuban linear methods in that viewers are able to tilt their head and look about the theater naturally without a disturbing loss of 3D perception, whereas linear polarization projection requires viewers to keep their head orientation aligned within a narrow range of tilt for effective 3D perception; otherwise they may see double or darkened images. Projektor video pawagam digital grade berresolusi tinggi memaparkan gambar mata kiri dan mata kanan berselang-seli 144 kali sesaat. The projector is either a Texas Instruments' Digital Light Processing device or Sony's reflective paparan hablur cecair. A push-pull electro-optical hablur cecair modulator called a ZScreen is placed immediately in front of the projector lens to alternately polarize each frame. It circularly polarizes the frames clockwise untuk mata kanan dan mengikut arah lawan jam untuk mata kiri. Penonton memakai cermin mata yang oppositely circularly polarized lenses untuk memastikan mata hanya melihat gambar untuknya sahaja, even if the head is tilted. Dalam pawagam RealD, setiap gambar dipaparkan tiga kali to reduce flicker, a system called triple flash. The source video is usually produced 24 gambar sesaat untuk satu mata (jumlah 48 gambar sesaat), which may result in subtle ghosting and stuttering on horizontal camera movements. A layar perak digunakan untuk to maintain the light polarization upon reflection and to reduce reflection loss to counter the inherent losses by the polarization filters. Hasilnya ialah sebuah gambar 3D yang seems to extend behind and in front of the screen itself. 3D systems for movies using polarized light cause a loss of screen brightness due to the inherent filter absorption. The polarization filter in front of the projector blocks half of the projecting light, reducing screen brightness. However, as half of all other ambient and reflected light in the theater is also reduced by the viewing lenses, the perceived contrast does not suffer excessively. The overall effect is that of wearing a pair of slightly darkened glasses in a standard movie theater, which could be compensated dengan menggunakan lampu projektor yang lebih terang. One complaint with many 3D display systems adalah sesetengah penonton mungkin terasa loya dan ingin muntah atau pening kepala. This effect is more likely with rapid cuts between scenes with very different depth, which directors and editors of 3D movies generally try to avoid. 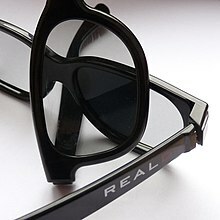 ^ "3D Technology Firm RealD Has Starring Role At Movie Theaters" 26 Mac 2009, "LA Times"
^ a b Cowan, Matt. "REAL D 3D Theatrical System" (PDF). European Digital Cinema Forum. Dicapai 2009-03-28. ^ Cowan, Matt. "Presentations (technical)". RealD Media Room downloadable files. Dicapai 2009-03-28. ^ Nick Watt (2009-12-19). "Will 'Avatar' Make Viewers Nauseous? The 3D Effects in Blockbuster Movie 'Avatar' Are Claimed to Be 'Vomit Inducing'". ABC news. ^ "How to avoid getting a 3D headache while watching Avatar". Shadowlocked. 2009-12-21. ^ Rafe Needleman (2009-06-18). "3D means new rules for directors".